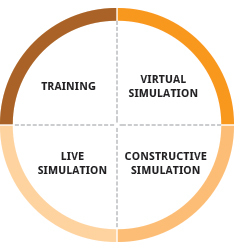 STE has developed a wide range of Training & Simulation solutions creating realistic environment for military, security and civil organisations to improve their readiness and skills when facing opposing forces, environmental disasters and other complex situations. The systems can be used at home stations, ground training centres, deployed locations, control rooms, industrial plant within Live, Virtual and Constructive (LVC) domains. STE provides T&S architectural design, integration with information systems and specific tools, 3D Modelling and Scenarios Generation, multilevel/multiservice training architectures, solutions to support Technical and Operational missions and Immersive environment. Immersive Command Operation Centres developed with web based technologies for need of coordinated multilayered applications are supporting well defined training objectives for pre deployment of Command personnel of Military, Security or civil organisations. on special vehicles machineries and plants as well as specific environments, trees recognition and scenarios for support to investigation. Firefighting and other disaster management STE provides multilevel training system with the built-in capability to be interoperable with models (vegetation, fuel type, weather/climate, etc), to predict how fire spreads, also supporting decision making and real operations. so as to meet the needs of any military and town security forces, in training in crime scenarios and protection in the environment citizens, where is need to practice well-defined tasks.